and a secret one (secret because its more than likely to fail and I don’t like to publicise my failings): take care of myself better! I realised that all four things, even especially the last one would improve my children’s day to day living. I also realised that really, my only resolution, new years or not, is to be a better mum… being able to drive, journaling our memories and my own emotions, doing less work and being more present, and taking care of myself better will all help me to be a better mum… but this also made me think about specific parenting resolutions that I want to make. And keep. Listen more and better. Listen intently. I am going to write this list up, prettify it and stick it on the wall, so I am reminded every day – to be better – to be the best I can be for my beautiful kids. Too many things get in the way of me being the mum I want to be. Distractions, house-keeping, anxiety, and a complex desire to create all the ideas I have right now… they need to take a back seat, they need to wait. My children are not going to wait. They are growing up Right. Now. There is not another chance to experience this wonder. These are the few short years that they need me. To cuddle them, read to them, watch them play, play with them, to hold them in my arms and in my sight every day. This is it. and I realised that, in addition to being mindful about the resolutions above, by taking care of myself a bit more, being kinder to myself… that I will be able to focus on them. Ive kind of lost myself in trying to be a hundred different things to a lot of different people. If I find myself, even a little bit, I will perhaps creep out of the anxiety and be a better me. And a better mum. 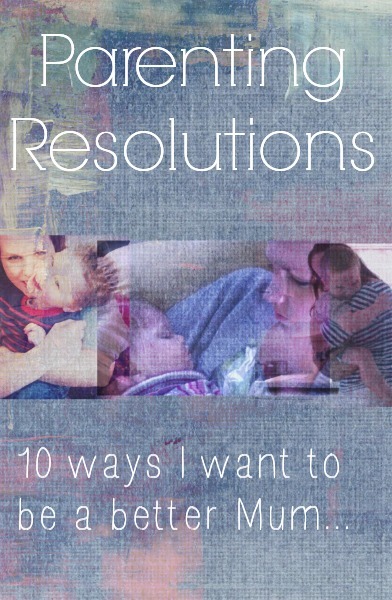 Do you have any parenting resolutions? How do you take care of yourself when you get a chance? Don’t forget to like Mummyology on facebook. Thanks for reading. Happy Mummying. A wonderful post and sounds like a wonderful lab. I am glad to have connected with you through KBN and now, more so, through Abundant Mamas! Oh – I love your list of goals too. I see many that are goals of mine. On meals, I have to suggest (if possible) joining a farmshare/CSA. We do and not only is a very affordable way for us to get organic produce, but the seasonal variety keeps me from getting in a rut with our menus!